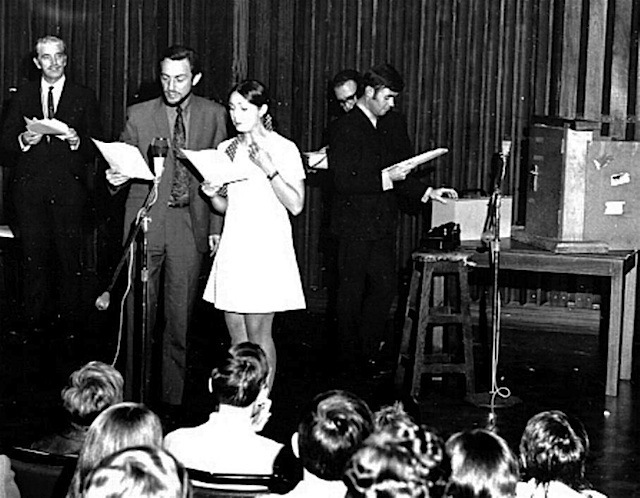 Members of the radio drama and theatre community are united in their sorrow at the passing of one of its finest, Gillian Claire Margaret Berry (nee Lomberg), who passed away on April 4, 2011. She had been ill for a number of years with motor neurone disease and it is one consolation that she is now free of pain and suffering. Gillian was born in South Africa and educated in the UK, France and Holland. She graduated from South Africa’s University of Natal Kwa Zulu (UKZN) with an honours degree in drama and literature. 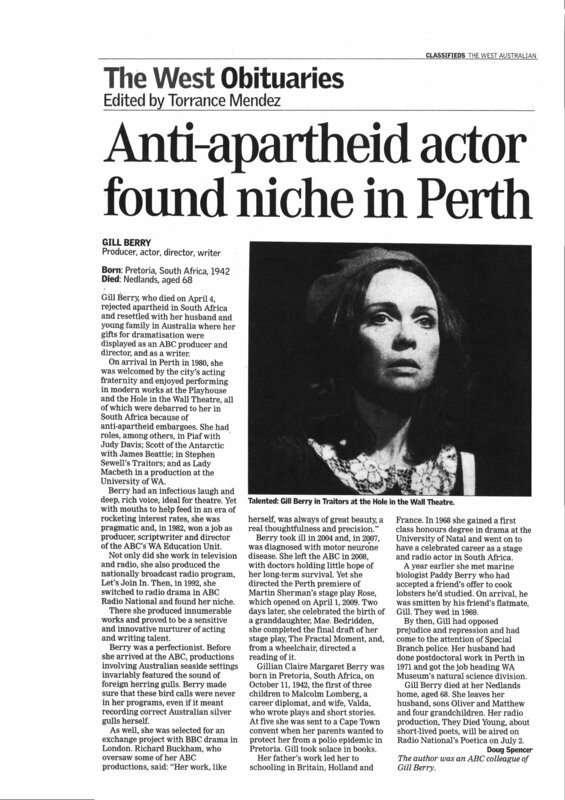 Gillian took part in literally hundreds of radio comedies, plays and serials in South Africa. Always up for a challenging role giving her best performance – often remarkable, never average. With Gillian, you always got more than you were expecting. A further tribute comes from former South African Broadcasting Corporation (SABC) radio drama producer, Don Ridgway, who is himself an actor and writer. 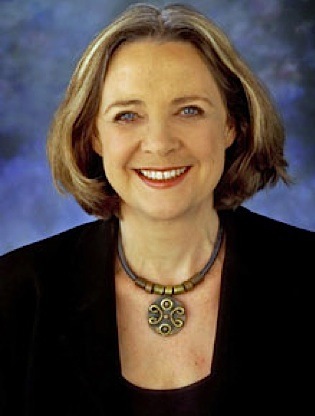 Gillian resettled in Perth with her husband Patrick and young family in 1980 to act locally at the Playhouse and Hole in the Wall Theatre before joining the ABC’s Education Department in 1982 as a producer and scriptwriter, working both in television and radio with such programs as the ABC television series For The Juniors and for children’s story programs Let’s Join In and Sing And Play. 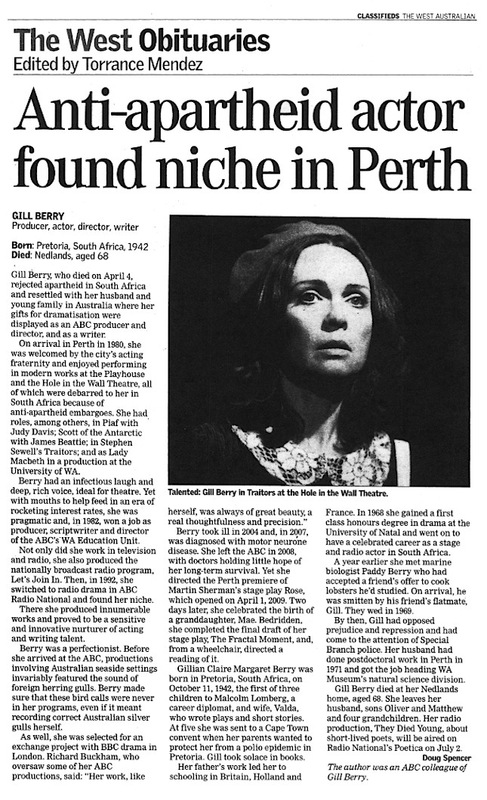 In 1992, Gillian joined Radio National’s Drama unit in Perth as a producer, where her dramatisation of Christina Stead’s novel For Love Alone (five episodes for ABC Radio Drama) was a finalist in the New York Radio Awards. She remained with the unit taking sick leave in 2007 and her formal retirement in 2008. “The first signs that all was not well appeared in 2004, when she started having problems with her right foot and had several incidents of tripping and falling. After a neurological problem was suspected, she went through a series of quite unpleasant (and as it turned out, unnecessary) treatments, such as plasma replacement, to eliminate some of the possible auto-immune diseases. She was finally diagnosed with MND in 2007. Gillian is survived by husband Patrick, sons Oliver and Matthew and grandchildren Huxley, Gordie, Stella and Mae. 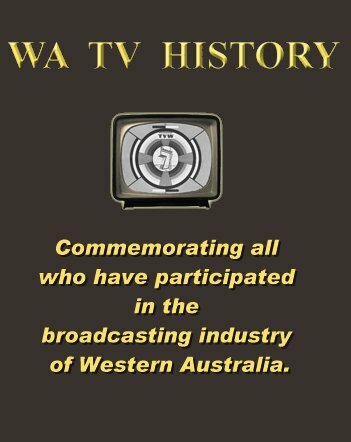 A excellent obituary provided by ABC colleague Doug Spencer can be found in the Wednesday 18th May copy of the West Australian newspaper. What a lady, the drama studio at the New ABC studios in Perth is a tribute to her directing skills in not only those who trod the boards but also those who nailed the boards together, and it was always done in a friendly understated manner. In this case it became her vision realised. My heartfelt condolences go out Matthew and Oliver, two fantastic boys I taught many years ago. Your mum was such a lovely person. Please could somebody give me an address for Gillian’s husband Paddy. She was my flatmate in London in 1964 and I would like to send him my condolences. I have only just heard the news about Gill’s passing.